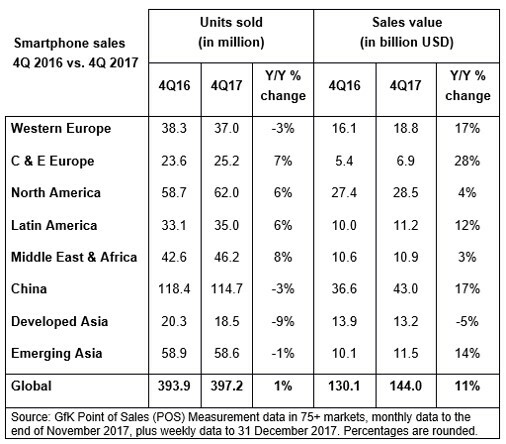 Counterpoint reckons Q1 2018 Chinese smartphone shipments declined 8% annually, but Canalys has a much bigger decline of 21%, while GfK is going for a more modest 6% decline. Counterpoint and Canalys will derive their intelligence from the supply-side – i.e. manufacturers, supply chain, etc, while GfK uses point-of-sale terminals to get a demand-side picture. Regardless of the method there will be a fair bit of extrapolation, conjecture and intuition in all the numbers, which explains why they can sometimes be so far apart. GfK is the only one of the three to talk about value as well, and in its released confirms this global trend is playing out in China. Smartphone revenues there grew by 14% to $41.1 billion in spite of the volume decline. 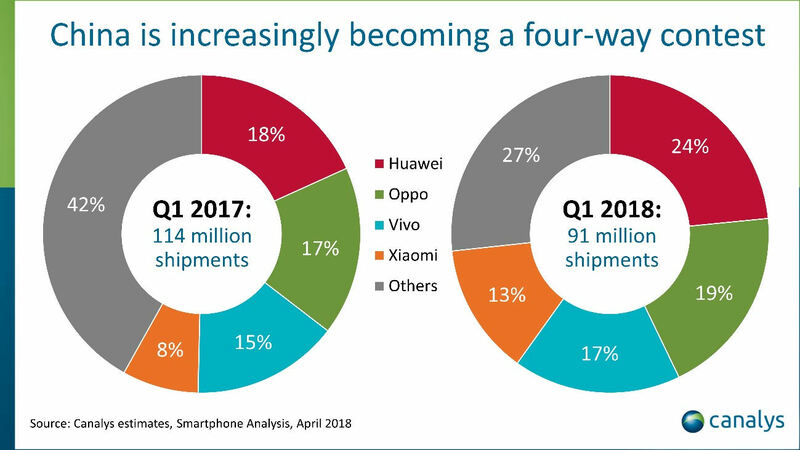 This seems to be down to the growing strength of the big smartphone brands, including Apple, and their ability to persuade Chinese punters to upgrade to more expensive devices. 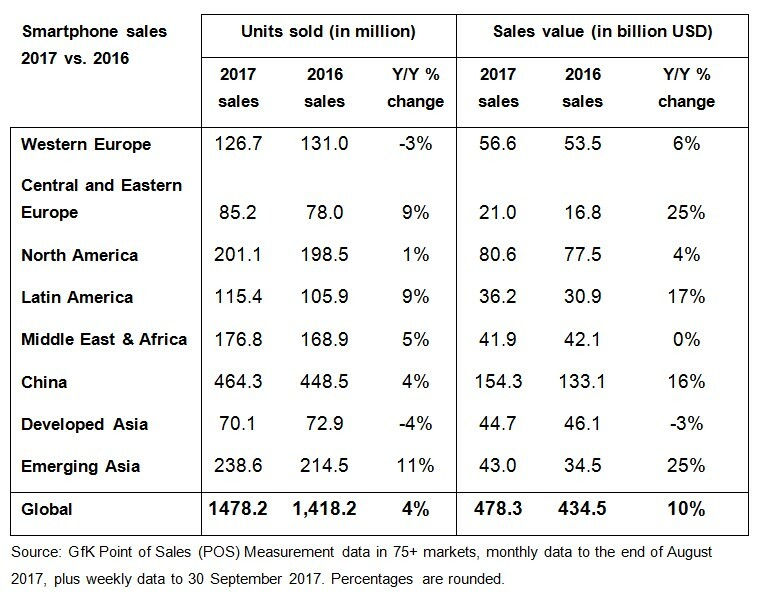 A couple of early looks at the Q4 2017 global smartphone market indicate the iPhone X sold well and dragged the average selling price up with it. GfK, which derives its data from point-of-sale terminals, reckons global ASPs experienced a record spike in Q4, growing 11% year-on-year. This trend seems to have been driven mainly by Europe and Asia, with Central and Eastern Europe ASP jumping 28% and Western Europe seeing the average sale value increase by 17% despite a 3% decline in sales volume. 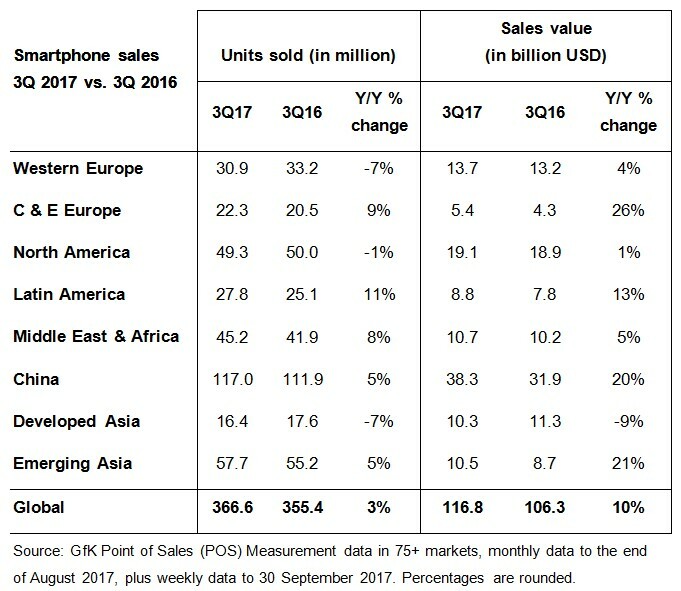 GfK didn’t comment on vendors but it can’t be a coincidence that Q4 2017 also marked the first time the £1,000 iPhone X went on sale. Yes, there are other expensive flagship smartphones out there too, but that was the biggie. Some early vendor numbers from Canalys, which derives its data from further up the smartphone channel, indicate Apple managed to flog a nice lot of Xs – 29 million to be precise. “The iPhone X performance is impressive for a device priced at US$999, but it is slightly below industry expectations,” said Ben Stanton, Analyst at Canalys. “Apple struggled with supply issues in early November, but achieved a massive uplift in production in late November and throughout December. It should be noted that Apple has yet to publish its shipments numbers and doesn’t publicly break them out by model. One of the main roles for industry analysts is to be better guessers than everyone else, so this Canalys datapoint needs to be treated as guidance rather than definitive. Having said that history has shown that large numbers of people with find the money for the latest Apple shiny thing, regardless of the price tag, so there’s no reason to wholly distrust the 29 million figure.